In 2016, Clay Art Center will present IN OUR BACKYARD, a year-long focus on the integral role clay has had on New York art, architecture and design. IN OUR BACKYARD features a series of 5 innovative exhibitions running January 30th – November 12th, 2016, several workshops and lectures, two collector’s tours and a culminating symposium – all of which reveal the dynamic co-mingling of the rich cultural playground in which ceramics thrives in NY and its surrounding areas. These events will be encapsulated and documented in a catalog celebrating this year-long celebration. There has been a seismic shift in ceramics in New York. Our backyard has never been more welcoming to clay than it is right now. This resurgence is due to a variety of factors – a return to touch and materiality and the loosening of boundaries between craft and art and the values that relate to the timeless qualities of this ancient and ubiquitous material. At a time when ceramics are being more broadly recognized as integral to the wider field of contemporary fine art, CAC is investigating who is expressing their vision through clay in our region and why their work is significant. As a prominent art space dedicated solely to ceramics, Clay Art Center is uniquely suited to bring these various elements together and provide the gateway to meaningful conversations. The New York City region is home to artists and professionals who use diverse approaches in their work – from new technology to platforms for social justice – and clay is right there in the mix. IN OUR BACKYARD and its related programs will investigate how clay is – and always has been – a part of everything that makes New York lively. Juried by Leslie Ferrin, curator and gallerist. This regional juried exhibition features a contemporary cross-section of emerging artists working within a 75 mile radius of CAC who are using clay as their mode of expression. Exploring relevant contemporary art themes through a lens of clay, this exhibit will embody the culture, trends and theories surrounding contemporary art practice in our region. Finalists had the opportunity to be juried by a renowned sub-committee for the grand prize, a solo exhibition at CAC in the summer of 2016. The sub-committee includes esteemed members of contemporary art and craft in NY: Glenn Adamson, Director of the MAD Museum; Barry Harwood, Curator of Decorative Arts at the Brooklyn Museum; David McFadden, Emeritus Chief Curator at the MAD Museum and Jennifer Scanlan, Independent Curator. Demonstrating the call for the handcrafted, the ‘Sloppy Craft’ movement emerged with pioneers such as Jessica Jackson-Hutchins, Nicole Cherubini, and Arlene Shechet. This approach is focused on craft that is messy and/or poorly crafted in appearance; an aesthetic more apparent in New York City. Roxanne Jackson will lecture about how the balance of craftsmanship and experimentation gives new meaning to contemporary ceramics. The eclectic mix of artists selected for NY, NY Clay are some of the most notable and visibly active artists working in sculpture today. They also happen to live, work and build their careers in the New York metropolitan area and use clay as a primary material for expression. Their work is a breeding ground of competing ideas and aesthetics. Some add video or installations, others focus on the hand-modeled object, paying unusual attention to detail and work with real or imagined narratives. Others rely on abstraction or reference ceramic history and the utilitarian object, melding the aesthetic of high art with that of craft functionality. They often incorporate multiple materials and reference ornamentation, assemblage, color field painting, or trompe l’oeil, into the narrative, and whatever unexpected twists and turns are encountered, they invite the viewer to reinterpret the meaning of art and the role material plays in the expression of ideas. Participating Artists: Claudia Alvarez, Ron Baron, Toby Buonagurio, Linda Casbon, Elisa D’Arrigo, Judy Fox, Kenjiro Kitade, Shida Kuo, Michele Oka Doner, Adams Puryear, Elise Siegel, Robert Silverman, Melissa Stern, Jessica Stoller andDerek Weisberg. Visit the studios of highly regarded artists and participants of CAC’s exhibition NY, NY Clay and HOT POTS. Destinations and dates to be announced soon! Clay has been driving the development of New York for centuries; it has been at the core of architecture, design, and industry like no other media and is still going strong today. While clay is in every museum’s holdings from the Museum of Natural History to the MET, it has only recently captured the audience of the fine art culture. CLAY AT THE CORE will focus on how clay has worked its way into every facet of New York and its current trend in fine art. Was New York where this seismic shift took place? 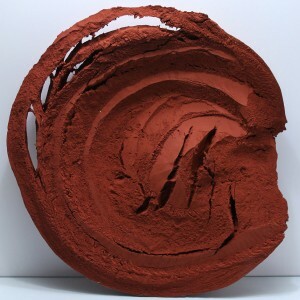 Does the acceptance in contemporary art change how we look at clay on the industrial level? We will investigate these subjects with panelists that represent the epitome of art and industry as well as the bridges between the two. Enjoy an afternoon of immersion in the culture of New York. There will be a brief intermission featuring a tea-tasting with Harney & Sons Fine Teas, and after the symposium all guests are invited to Clay Art Center to view NY, NY: Clay and hear a gallery talk with the curator, Judith Schwartz, Ph.D. Featuring the talents of 2 artists who have been selected for our year-long Artist-in-Residency program. The works will exhibit the culmination of their focus and studio practice at CAC, and as part of IN OUR BACKYARD, we will investigate how their immersion in this urban, eclectic community environment shaped their paths as artists/makers. A recent MFA graduate from University of Florida, Gainesville, Chris Pickett’s hand built porcelain combines form, color and design to create utilitarian work that is culturally relevant and aesthetically poignant. His forms and imagery are often suggestive of physical intimacy, personal domestic spaces and childhood experience. Max Seinfeld’s experimental sculpture is transformed from fiber into ceramics. A recent post-baccalaurate from SUNY New Paltz, Seinfeld has developed a body of work through a process-oriented practice, creating non-referential sculptures that address material and process. His repetitive artistic methods explore the possibilities and limitations a material presents through alternative modes of making. From the 20-25 artists chosen for TRISTATE OF MIND, one will be selected for this solo exhibition. The selection committee (listed above) is highly engaged with the NY art and design scene and deeply invested in choosing a next generation of artists. The intention would be to propel this artist in their career and make them known amongst individuals who have the capability of igniting interest in their work locally and globally in the field of contemporary art. This invitational exhibition features utilitarian works by 40 emerging, mid-career and established contemporary artists, paving the way for new ideas within the functional art context, yet also branching out to access themes not exclusive to utility. The co-curators have selected artists whose works are especially noteworthy and exemplify the developing nexus of design, industry, and discourse. Invited artists include: Jonathan Adler, Sin Ying Ho, Tom Sachs, Brian Czibesz, Arnie Zimmerman, Frances Palmer, Bethany Pelle, Adam Welch, Klein Reid, Toni Ross and many more. These artists find themselves in a position to engage an audience through the role of domesticity, and ultimately challenge viewers to consider esoteric themes in a context that has an accessible vocabulary. Clay Art Center is a not-for-profit ceramic art organization offering exhibitions, clay classes for adults and children, studio spaces for clay artists and outreach programs in the community. It is located in the heart of Port Chester at 40 Beech Street, Port Chester, NY 10573. Gallery hours are Monday through Friday, 10am – 6pm and Saturday, 10am-4pm or by appointment. For more information or images, please contact Dominique Mason, Communications Manager at [email protected] or call 914-937-2047x 226. This exhibition and its related programming have been generously sponsored in part by: New York Council on the Arts, Arts Westchester, Robert Lehman Foundation, The Marks Project, Harney & Sons Teas, Larry Hawk, Ted Rowland and Priscilla Young. *** high resolution digital images available upon request. This entry was posted in Exhibition and tagged #ceramicarts #clay # clayartcenter #, Art Exhibition, new york. Bookmark the permalink.